Online is only for only for decathlon.co.uk, other countries are in-store only. 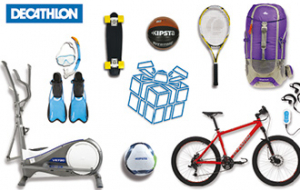 DECATHLON: 70 Sports under one roof! Whatever your sporting needs you will be blown away by DECATHLON’s range of 50,000 Sports products across 70 sporting categories, from running to horseriding, canoeing to scuba diving. DECATHLON don’t just offer an eye watering range of products at unbelievable prices, all DECATHLON’s teams play sport, playing the sport of the department they work in, meaning that they can advise you not only on the best products for your needs but also where the best sports centers and clubs are locally. This gift card can be used to make purchases in Decathlon Stores in the UK, France, Germany, Belgium, Netherlands, Monaco, Spain, Portugal, Italy, Hungary, Poland, Croatia, Czeck Republic, Slovakia, Bulgaria, Romania. It can also be used on www.decathlon.co.uk. (Enter the 16 digits of the gift card and the Internet PIN code). This card is valid for 2 years from the date of purchase. Any balance left on the gift card after this time will be deducted. No change will be given for purchases made with this card. Decathlon cannot replace or reimburse the value of the gift card if it is lost, stolen, or if its validity period expires.